So, Mr Snail-of -happiness drove off yesterday morning to our local tyre emporium and then to help with a house move and I settled down to do some paid work. 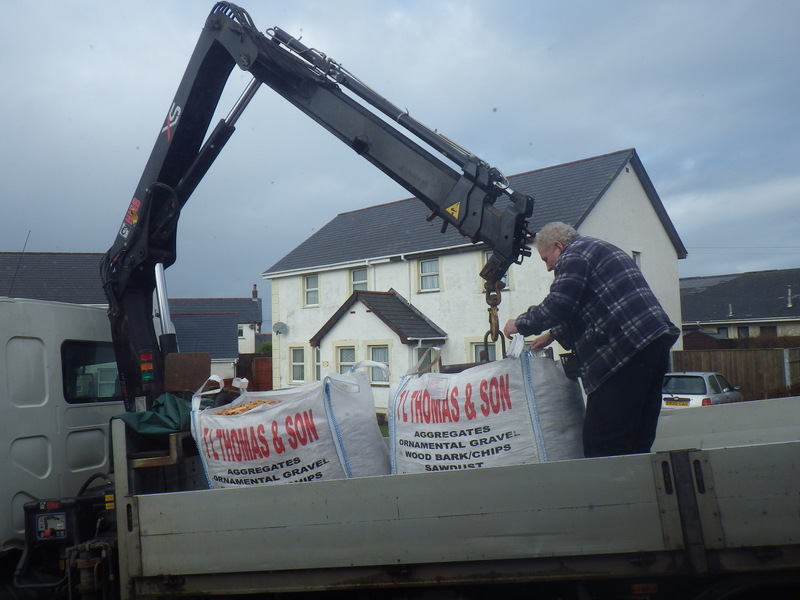 At which point the new woodchip for the chickens was delivered… two cubic metres (about 70 cubic feet). He has great timing! 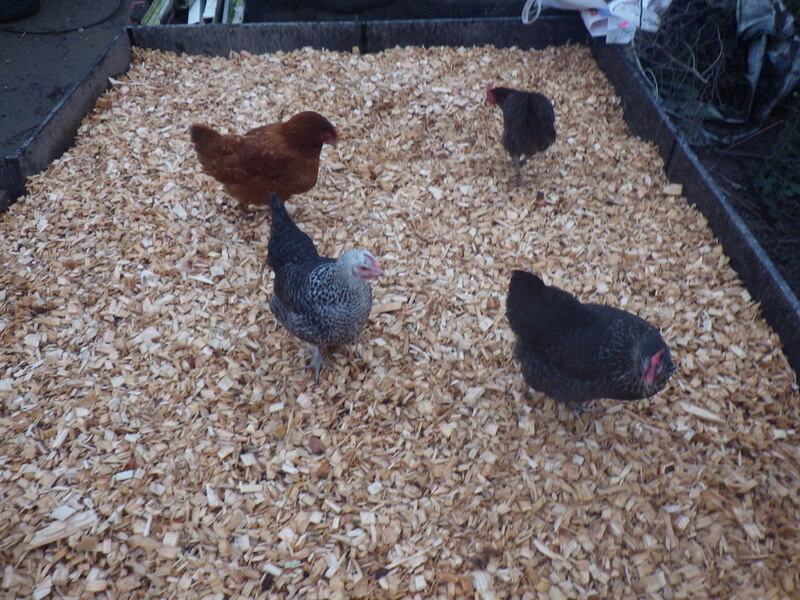 The idea was to spread a new, thick layer of woodchip over the chicken’s patch to keep the hens drier and save us having to part-exchange them for some ducks. The closest it could be delivered was the front of the house, meaning that it needed to be moved round to the back by hand – and by me. So, setting aside the editing to make the most of a day when it wasn’t raining, I reviewed my options. We have a barrow that is good for most jobs, but the chicken area is surrounded by a 30cm barrier to raise it above ground level and it’s a pain to get over this with the wheels. I, therefore, decided to use a large tub-trug and carry it round until the bags were light enough to drag. Always good when the chooks don’t wear large mud gumboots… I used barley straw for much the same purpose, and the girls loved it. They’d shift the entire two balefuls from one side of the chookyard to the other in an afternoon in their search for grains. 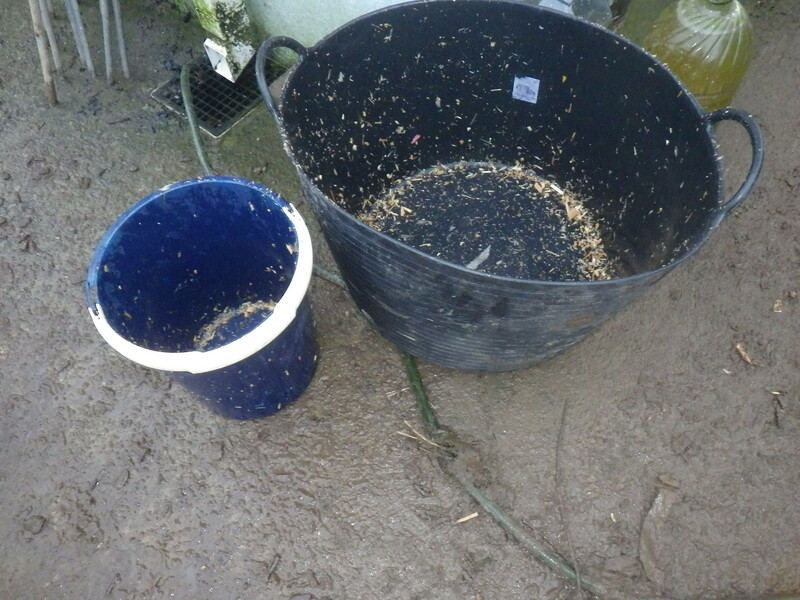 Plus you’d get odd grains sprouting, which gave them some additional green pick in their enclosure. Hope you’ve recovered from your exertions and can settle down to some nice soothing book work! A friend has been using chopped hay for indoor bedding, which sounds nice – it’s treated with pine oil to reduce parasites too, so I might give that a go for their laying boxes next time I need bedding. 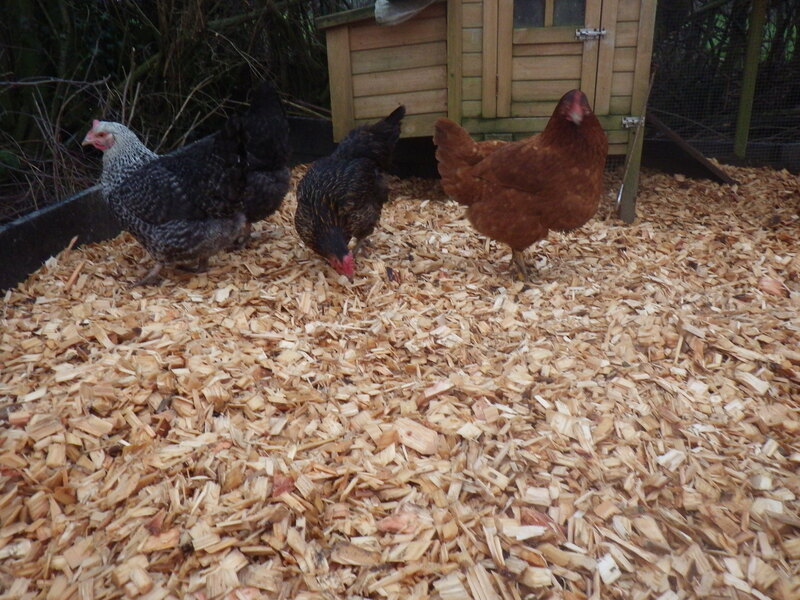 I’m feeling really pleased about the woodchip, especially that I moved it all on my own. I suppose that’s a better option than trying to buy them wellies. Though given long enough in our weather they might have developed webbed feet anyway in a couple of generations. That must have been a Herculean task and I hope you’re not suffering because of it. Nice to see the girls dry and foraging as though nothing matters except that. I have to say that my shoulders are complaining a bit today, but it was worth it! We’ve been having to put them in the fruit cage, just so their feet can be dry for a while! It really is lovely to have transformed their main patch… and it’s great not to have to slosh through all that mud to collect eggs! I’m sure they’d love getting free access to the fruit cage! We ended up putting the shed where our girls sleep on gravel, then a pad of concrete pavers, with a further layer of pavers fitted to the inside so no water could creep up into it. That made a big difference so they could at least have a dry retreat. When you can find them anywhere dry it really does feel like they might turn into ducks doesn’t it! Hi Jan, I’m interested to know where you bought the woodchip from and how much they charge? I’m sick of squelching, slipping and sliding too. I’ll tell you about it next Thursday, assuming you’re going to be around. I loved reading your post! We gardeners love our composting! Best wishes on your garden; I’m eager to get back to it for another season. Here, in the north Texas area, we can usually begin planting in late February, early March. I’m going to plant a few things in my propagator this weekend… currently it’s far too wet to do anything in the garden and the greenhouse is flooded 😦 However, I have lots of seeds and plans to make… even if you can’t go anything out there, there’s always something to think about!